Canadian collective Broken Social Scene has announced details about the band's upcoming fourth album (fifth if you care to count 2004's collection of B-sides, Beehives), including a May 4 release date. The album has yet to be titled, but will feature such guests as Leslie Feist, Amy Millan and Evan Cranley of Stars, Emily Haines and Jimmy Shaw of Metric, Jason Collett, Ohan Benchetrit of Do Make Say Think, The Sea and Cake's Sam Prekop, Pavement's Spiral Stairs, and several others. The album was co-produced by the band and Tortoise's John McEntire in Chicago. 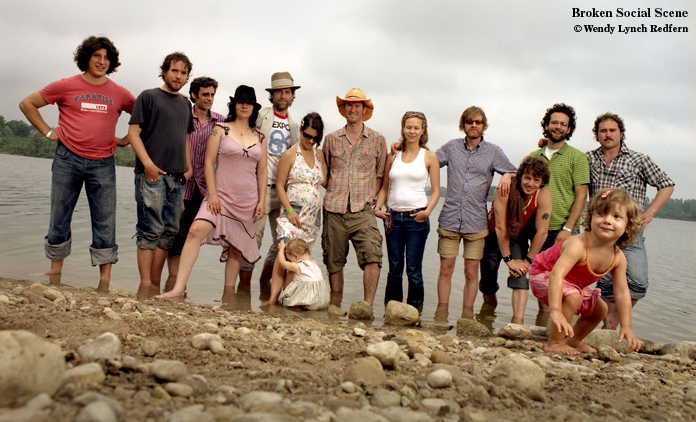 Broken Social Scene is also hitting the road in support of the album. The tour includes a stop in London with Pavement, and a stop in Ontario, where the band was forced to cancel a date last year. Broken Social Scene has previously featured many high-profile collaborators (Feist, Emily Haines of Metric, Amy Milan of Stars). No news yet as to which faces (old or new) we'll see on this tour.